The U.S. Library of Congress recently acquired a twenty-five print collection of award-winning photographer Jamey Stillings’ “Changing Perspectives: The Evolution of Ivanpah Solar” work, adding to his previous portfolio there: Bridge at Hoover Dam, this collection will also have a digital archive hosted within the Library of Congress’ Prints and Photographs Collection. 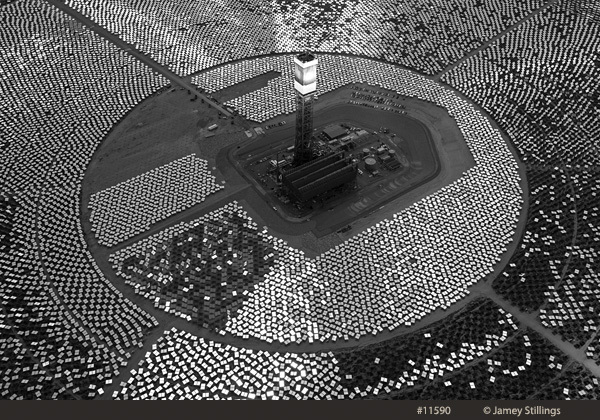 Initiated in 2010 “Changing Perspectives: The Evolution of Ivanpah Solar” is an aerial photographic study chronicling the development of The Ivanpah Solar Electric Generating System, in the Mojave Desert of California. Just completed, Ivanpah Solar is the world’s largest concentrated solar thermal power plant. 173,500 heliostats (mirrors) focus the sun’s energy toward three towers creating 392 megawatts of electricity, enough for 140,000 US homes.